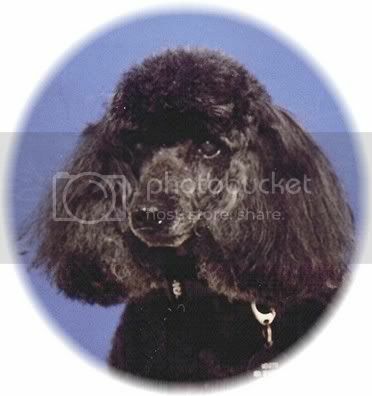 Not sure how many remember when I posted about taking in my elderly miniature poodle. To refresh, a member of my dog club passed away and her 15 year old mini poodle didn't have anywhere to go. I've since found out that the owner who passed had actually asked that my Monette be put down as she didn't think anyone would take in a 15 year old dog. Her family didn't want to follow her wishes (or at least the granddaughter, executor didn't) but they also didn't care enough to want to keep her. Their loss, my gain, she is an awesome dog. I asked time and time again for vet records, some photos, hey her papers would have been nice. I have since found out that the granddaughter has thrown most everything out. The last time I talked to her, she did say that she had a couple of professional photos that she hasn't thrown out and would drop them off for me but I haven't seen hide nor hair of anything. Anyway to make a very long story a little shorter (sorry this whole situation still makes me a little steamed), I took her to have some professional pictures done myself. I think she looks absolutely beautiful in the photos and I thought I would post them since I posted a picture of my new little dane boy in the photos section. Can't leave my old girl out. My Monette turns 16 on the 27th of this month and it was a year this weekend that we have had her. Wow, she looks fantastic. Really great for 16! I had a black min. 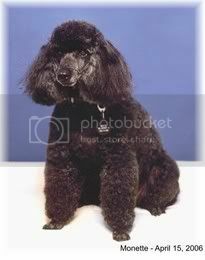 poodle and he was skin and bones by the time he was 12 until he died at about 15. Couldn't put weight on him for anything. Maybe you could contact the vet yourself, assuming you know or could find out what vet? I have been to her vet a couple of times and they were able to tell me her b'day. Didn't even know that, when was the last time she got her teeth cleaned etc. The only reason I knew which vet it was, was because she was on meds for her bladder when we got her and the pill bottle still had the label on. Anything of importance I imagine we could get from the vet, now anyway. But it was more important to me when we first got her. Really makes me sick that the granddaughter threw all those pics away. Monette won all kinds of obedience titles in her day and had tons of "stuff" that was hers. The granddaughter sold all of the stuff at the estate sale. I imagine her awards and other stuff was probably thrown away. She had a silver lame dress specially made for her that I managed to get my hands on in a roundabout way, months after we got her. She performed with her last owner in something called canine cut-ups in which she wore the dress. Bothers me very much, because I know what a treasured companion she was and she was treated poorly and with very little respect after her owner passed away. How wonderful that you took this girl in. How good of you to take her in. I would have been very upset by her families actions also.